Both instruments are designed for sectioning samples embedded in plastic blocks up to 12 mm x 16 mm. They cut block faces 200 limes larger than those used in electron microscopy with lithe or no distortion. Even lymph node, kidney, liver and undecalcified bone can be cut consistently thin – as thin as 0.25 pm – to visualize finer structural detail. They also section paraffin blocks as thin as 2 pm, and up to 40 mm long. High quality thin sectioning results from the instruments’ unique advance system. The lead-screw advance is smooth and steady to give precise, accurate sections thin enough to prevent overlapping cell layers which can create misleading double images. Both the JB-4 and JB-4A accept steel, glass or diamond knives and the knife and block may be independently oriented to form pyramids and mesas prior to ultra microtomy. And, they may be used with thermoelectric freezing stages to section frozen tissue. Sorvall JB-4 Microtome for plastic and paraffin sectioning. Features precision lead-screw advance system with manual handwheel drive. Dial and indicator for section thickness control, variable from 0,25 to 10 μm Another indicator shows when advance mechanism needs to be reset. Advance may be disengaged for block trimming. Lockable handwheel. Stainless steel deck. Metal base. Sturdy plastic cover. Precision stage has coarse advance micrometer marked in 10 μm increments with click stops for forward advance of stage. Laterial movement controlled by adjusting knob. Mass 30 kg (Net weight 66 lbs). Shipping mass 43.5 kg (Shipping weight 96 lbs). Dimensions: 30.5 cm Width x 55 cm Depth x 26 cm Height (12 in W x 21.5 in D x 10.25 in H). 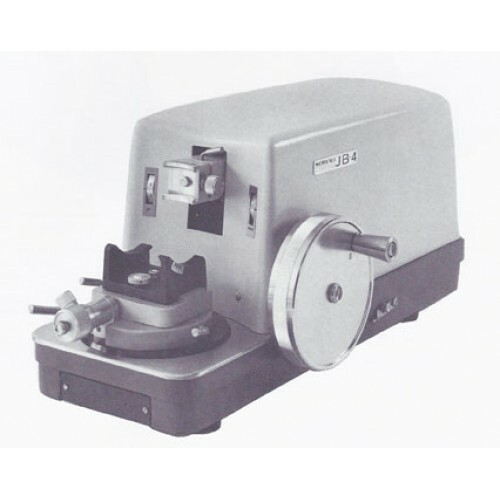 Sorvall JB-4A Microtome, for plastic and paraffin sectioning, is similar to JB-4 but with motor drive. Speed control variable from 0.7 to 3.3 mm/s. Pushbutton controls for start/stop, single section or continuous sections. Electrical requirements: 115 V, 60 Hz. Step-down transformer (Part No. 04264) needed for 220 V, 50 Hz. Mass 31.9 kg (Net weight 70 lbs). Shipping mass 45 kg (Shipping weight 100 lbs).